Here are the speed test results for writing. The histogram on the left shows the time per test, which is nicely summarized on the right for those who prefer whisker plots. The resulting file sizes are all pretty-much in the same ball-park, with JSON a bit bigger (the cost of being fully human readable, I suppose). 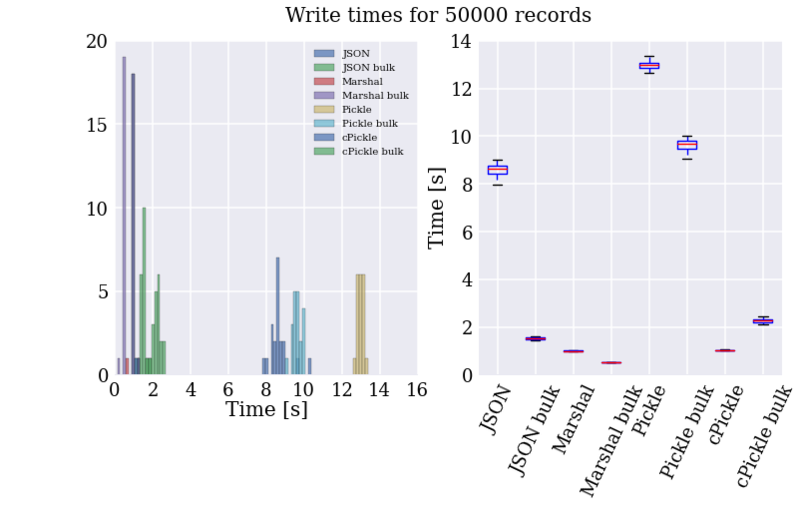 Marshal is over twice as fast as the next fastest method, and two orders of magnitude faster than the slowest method. This seems to be because it does less formatting of the data before serializing it. In most cases, “bulk” writing, where the string representation of multiple records is generated in one step, is faster than writing individual records. The only exception is using the cPickle module, where this is reversed. I have no idea why cPickle is different, it doesn’t make much sense intuitively, and couldn’t find any good explanations online. So, Marshal seems to be the fastest at writing the data to disk, but this is important only once when I pass through all the records to convert them. How do they compare when I perform a similar speed test to read in the records from the files generated in the previous step? Well, looks like I’ll be using Marshal then, huh? Not so fast! This is all well and good, but much of the slowness of the text file parser comes from the for loop. Damn these interepreted languages and their inefficient byte-code. 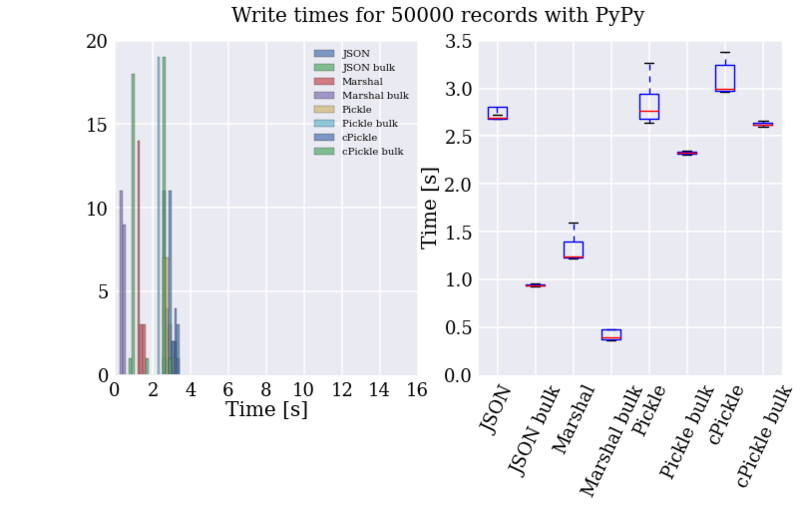 How do things change if we let the PyPy’s JIT compiler turn it into cached machine code? Let me just say that I am super impressed with PyPy (also, apparently, I wasted my time with writing up the code for all these formats). 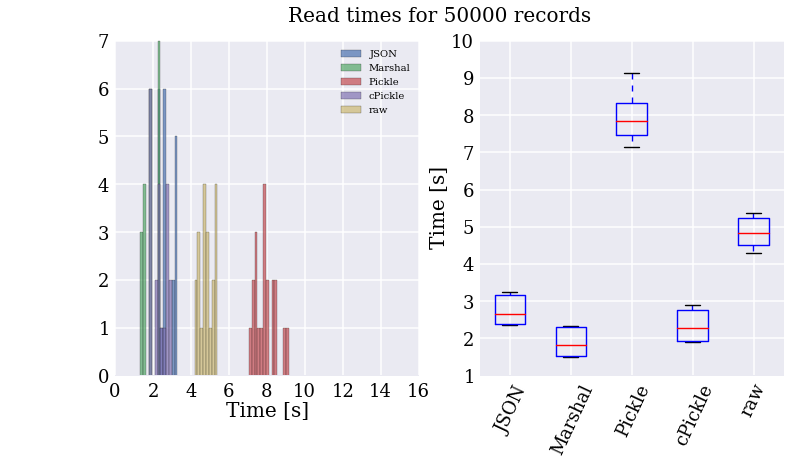 Reading the “raw” text file is now the fastest method of accessing the records, taking on average one second to read 50k records (about 150k lines of data with 4 to 26 fields of numbers). I got a couple more speed-ups by optimizing the parser, the biggest of which came from using named tuples instead of dicts. Since these make use of the new-style classes’ “__slots__” attribute to remove the overhead of dynamic dict lookups. 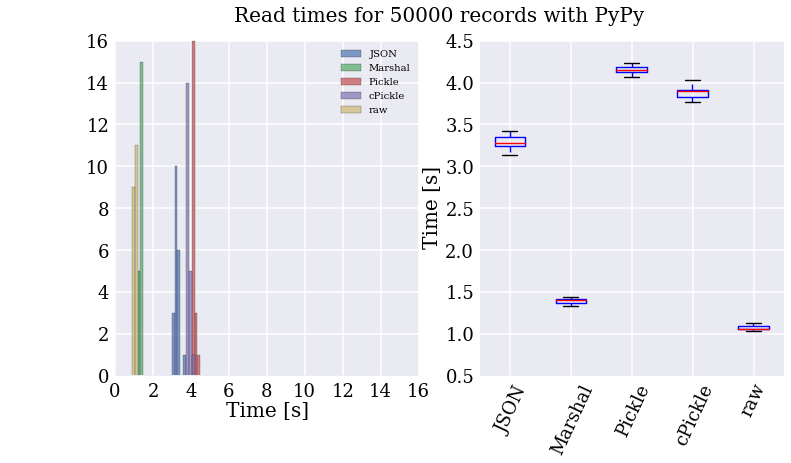 Bottom line, using PyPy and those additional modifications, I can read through all 34.5M records in under 20 minutes! Sampling from the records, I can prototype new features in a few minutes, which makes development much smoother. This entry was posted in Kaggle, Python by Emanuel Strauss. Bookmark the permalink.